"Can't they just get over it already?" It's a sentiment I've seen flying around, in various forms, over social media as people process the the recent non-indictments of Darren Wilson and Daniel Panteleo. Two recent instances of unarmed black men dying at the hands of white police officers. Two of many instances throughout history, building to these two fateful summer days when two black men met their fate in the form of law enforcement. The initial instances sparked unrest and protests, a flame only fanned when these officers were not indicted by grand juries for their actions. The past few months have flooded social media with public conversations on the issue of race. I've participated in very civil discussions on the matter as well as mud-slinging rodeos that attempted to call themselves "dialogues." Some people don't agree with the idea of having these discussions in arenas like Facebook or Twitter. But I've engaged these social media conversations because, if not there, then where? I am the first to admit that my life could use more diversity. Whose couldn't? As a result, many of my circles are overwhelmingly white. And as these conversations have unfolded, I've been quite surprised by the responses and statements I've seen conveyed by my white peers. As they process the media coverage of crime scenes, of news reports, of coroner findings, of peaceful protests, of groups of people expressing their anger through rioting and looting, there is a general sense of, "I just don't get it." "Don't they realize that hurting their own communities doesn't change anything?" "There they go, playing the Race Card again." "Slavery?" ::eyeroll:: "Aren't we past that?" "By looting stores and burning buildings, they aren't helping their reputation." "If they don't want to get shot by cops, they shouldn't keep committing crimes." I think the thing WE fail to see as white Americans is the Bigger Picture. People aren't expressing anger over "just" Michael Brown. The water didn't start to suddenly boil over after the death of Eric Garner. It is the days upon weeks upon months upon years upon decades of discrimination and disenfranchisement that people of color have faced in this country. Discrimination and disenfranchisement that we, as white people, have never known. I often get the eye roll when I bring up slavery. Another exasperated comment of, "Can't we just let it go and move on?" Because as we look at the anger, frustration and fear our fellow Americans of color are feeling and expressing right now, we have to ask WHY. And to answer that, we need to peel back the layers. We need to start at the very beginning. When Europeans came to this country, it was as explorers. It was at an advantage. They had power. They ruled. They called the shots. When Africans came to this country, it was as slaves. It was as a subservient creature that existed solely for the purpose of accommodating the needs and whims of white Americans. We all know the long, agonizing history African Americans faced in this new country. Their struggle toward Emancipation. But abolishing slavery did not quickly mean that black Americans were on level ground with white Americans. Let us remember Jim Crow, Separate but Equal, and the battle to Desegregate. Yet even as we made these small steps of progress, it was never enough to penetrate the collective psyche regarding race in America. - People of color make up 30% of the population, but make up 60% of the prison population. - People of color experience housing discrimination 4 million times per year. - Students of color are more likely to be retained in school and face disproportionate levels of discipline as compared to their white peers. - People of color experience higher rates of arrest for selling or using illegal drugs, but are no more likely to use or sell drugs than whites. - People of color receive sentences that are 10% longer than white offenders. So as we watch the protests, the demonstration and, yes, the looting, we have to broaden our scope. 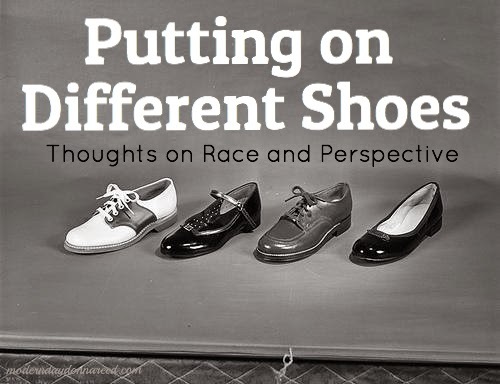 We have to make the very important decision to step out of ourselves and put on their shoes. Then we need to walk a mile in those shoes. We need to imagine, for a moment, that the universe was reversed. And their history was our history. That this was our story. That those who experienced slavery and segregation not so long ago were members of our families. That this discrimination was our daily cross to bear. That the lives being lost were our sons, our fathers. If this tale of discrimination was our story, we wouldn't just let it go. We couldn't just move on. Because every time we wake in the morning, and our eyes open to sunlight, we would brace ourselves for another day of marginalization. We would wake to a country that isn't representative of us, a society where opportunities are not the same, a community where our life experience is still separate. Perhaps one day, like a slowly-expanding balloon, we too would pop. Is every form of frustration being expressed acceptable? I know that you may not agree with what I am saying. And that's okay. Because I feel the important thing right now is to be talking about it. We need to stop treating the discussion of race in the public arena like the faux pas of bringing up politics and money at a dinner party. We need to listen to the experiences of our fellow Americans of color. We need to diversify our worldview. We need to be open to being wrong. We need to own the history of America and accept it's faults. We need to be willing to change our perspective. And above all, we need to ask why. I've love to continue and engage this discussion - in a respectful and civil manner.